Fall golf is a truly spectacular time of year. Leaves changing colors, temperatures cooling and the sheer beauty of the landscapes coming alive. For many this leads to outerwear being taken out of the closet and layering being done to stay warm as the year comes to an end. A few weeks ago, THP had a chance to sit down and speak with Andy Bell, from Bobby Jones apparel and discuss this very topic. Bobby Jones was one of the greatest golfers in the history of the sport and his name has always been associated with grace and dignity. 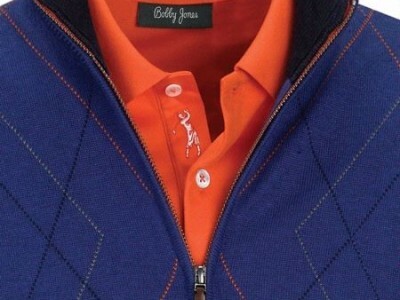 The Bobby Jones brand of apparel and golf equipment represents quality, class and luxury, catering to men and women. When it comes to outerwear, few items in the wardrobe offer that classical elegant look quite like a sweater. With that being said, few companies offer the traditional look and high quality in this category quite like Bobby Jones apparel. The Tri Color Raker Sweater pictured above is a 1/4 zip pullover and features vibrant colors that can match countless outfits or be the featured piece for the round. The silk, cotton and cashmere blend takes this garment from beautiful looking and adds in comfort that is second to none. 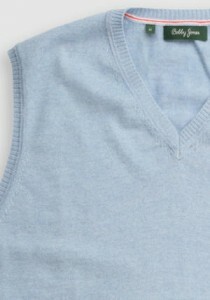 Golfers that prefer the look of the sweater vest when layering up, especially on those lighter temperature days, the brand offers wonderful options such as the Solid Merino V-neck that comes in close to a dozen colors and is 100% fine merino wool. Soft, comfortable and finished in a way to keep the look for years to come with proper care. No golfer that plays in different climates can be complete without jackets and vests to layer with. 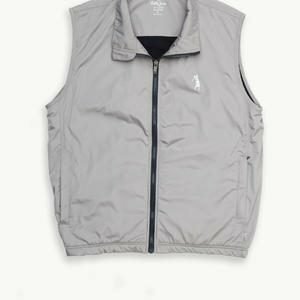 The Microfleece lined vest features a full zipper and incredibly soft interior, while the exterior is both water and wind resistant. This 100% nylon piece is a perfect compliment to those days on the course that start out a bit crisp and cold in the morning, but as the sun comes out, the weather gets a bit warmer. If you have not had the pleasure of trying on some of the Bobby Jones outerwear, THP strongly suggests giving the brand a try. When you mix incredible quality with a traditional look sought after by so many golfers you have a recipe for success. 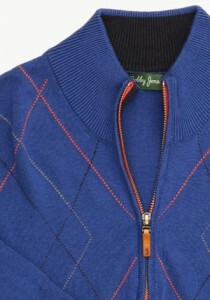 For more information on the pieces featured above or any of the other complete line of apparel, check out their website at www.bobbyjones.com. Want To Test TaylorMade SLDR Fairway Woods & Hybrids? Wow, this looks great. I love Bobby Jones clothing. This is some very very good looking apparel. Wife and I have been discussing a wardrobe overhaul for me and this fall line would fit in nicely. Love the warmer core gear while allowing the arms to swing freely. I need to find some of this stuff. Thanks for sharing some of the new collection with us!